Ahead of her inaugural party conference as Conservative Leader, the latest in a new series of Survation omnibus polls continues to show Prime Minister Theresa May as the most favourable party leader, with a slight increase (+3) on her rating since the last poll. 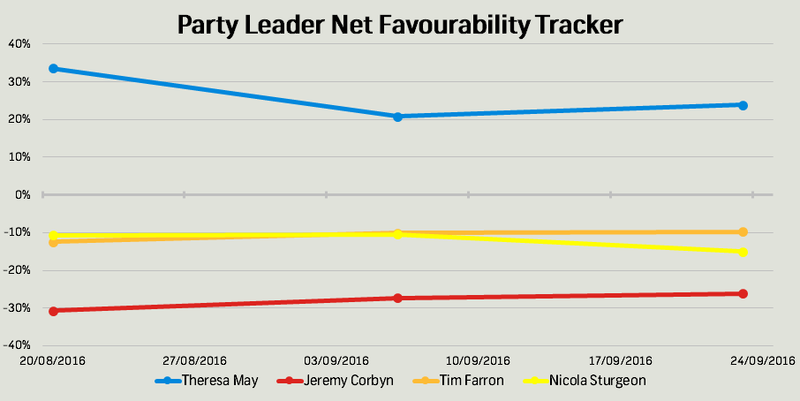 Mrs May’s positive rating of +24 continues to compare favourably to Jeremy Corbyn’s -26, although fieldwork was conducted before the Labour Leader was re-elected and gave his leadership speech at his own party’s conference in Liverpool. Theresa May’s cabinet colleagues also continue to rate relatively well among those polled when compared with other politicians: Foreign Secretary Boris Johnson has a positive rating (+9) and Chancellor Philip Hammond (-3) and Home Secretary Amber Rudd (-6) have only a single-figure negative rating. For the first time we polled Diane James in the favourability ratings. Her rating of -5 could be considered a positive considering her predecessor’s final rating of -32; however, only a quarter of the public expressed an opinion on her. This comes in comparison to the three-quarters who expressed an opinion on Nigel Farage in our last poll. Although it’s early days for the new UKIP leader, she clearly has work to do on the name-recognition front. Tim Farron is another politician where less than half of the public expressed an opinion regarding his favourability (35%). This hasn’t increased a great deal from our previous poll, perhaps indicating that Farron’s performance at Lib Dem conference did not get too much mainstream exposure. Survation polled 1,013 UK adults aged 18+ between 22nd-23rd September 2016. Full tables are available here. To enquire about adding questions to Survation’s UK or Scottish Omnibuses please email online@survation.com or call 0203 818 9661.